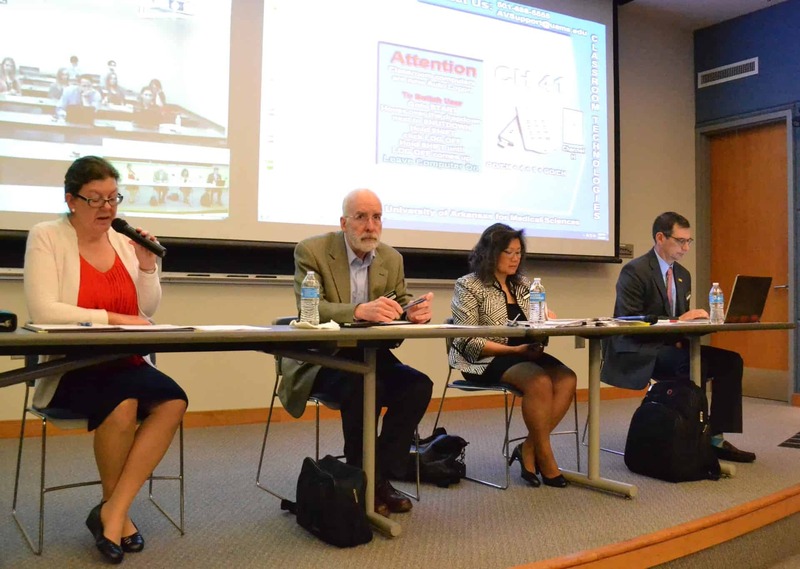 A team from the Higher Learning Commission visited UAMS on April 17-18. Aug. 24, 2017 | Aug. 24, 2017 | The University of Arkansas for Medical Sciences (UAMS) has been reaccredited for another 10 years by the Higher Learning Commission. The Higher Learning Commission is the regional accrediting body for higher education institutions. Accreditation with the Higher Learning Commission is important to UAMS for many reasons. It enables students to transfer credits and degrees to other accredited colleges and universities. Many organizations that offer professional licensure require graduates come from accredited institutions. Accreditation is also required for students to receive federal financial aid. UAMS is accredited under a process that includes comprehensive evaluations at the four- and 10-year mark, with the 10-year evaluation determining its reaccreditation status. Its reaccreditation is effective through 2027. The process includes submission of thousands of pages of documentation on the part of the institution; a federal compliance review; surveys of students, faculty and staff; and an on-site peer review visit, which was conducted in April. Gardner credited campuswide participation for contributing to the success of UAMS’ application. Students and staff responded to the necessary surveys and attended events as part of the peer review. Tim Hill, UAMS Health System chief operating officer; Bob Bishop, vice chancellor for Institutional Compliance; Kevin Ryan, associate dean in the College of Public Health; Susan Long, associate dean in the College of Health Professions; and Bill Bowes, chief financial officer, chaired committees to develop key pieces of the documentation submitted to the commission. In addition to Gardner, the process was led by Associate Provost Elizabeth Bard and Program Manager Jeffrey DeSantis. The formal vote for reaccreditation was taken on Aug. 1 by the Higher Learning Commission’s Institutional Actions Council. The Higher Learning commission accredits institutions in 19 states, mostly in the Midwest and South. It is one of six regional accrediting associations in the United States.